Fangie automatic waterer for lazy people, Most Easy Use Plant Watering Device for Your Houseplant. A simple and effective way to water your plants when you are away or have no time to take care of your plants. 3. Fill the plastic pipe on the main body of the watering device with water. The green cap and the plastic pipe are also filled with water (can be placed on the faucet so that the plastic pipe is filled with water). ♠1. In order to watering better, put the bottle watering device level below the high end of the green plastic cover. ♠2. Please note the demand of each plants and pots size,and uses the appropriate pieces of watering devices. ♠3. If failure to water your plants, please repeat the above operation steps. ♠4. After months of using, the ceramic piece parts need to be cleaned so as not to affect the effect of continue-using. 100% Money Back Guarantee - in order to give you a better customer experience we promises a full refund to any dissatisfied customers. 【✿Measurement✿】:Connect tube is 78 cm/ 30.7 inches in length. Enough length can be adjusted according to different plant needs and the height of the water bottle.It's perfect for vacation - when you're on vacation or don't have time to take care of your plants, it will be your best bet. 【✿Materal✿】:With the highest grade ceramic materials+PP ,Includes 6 pack Fangie for Potted or Hanging Plants. environmental protection,exquisite workmanship, They are good for seeding, planting without pollution;non-friable, durable and convenient. 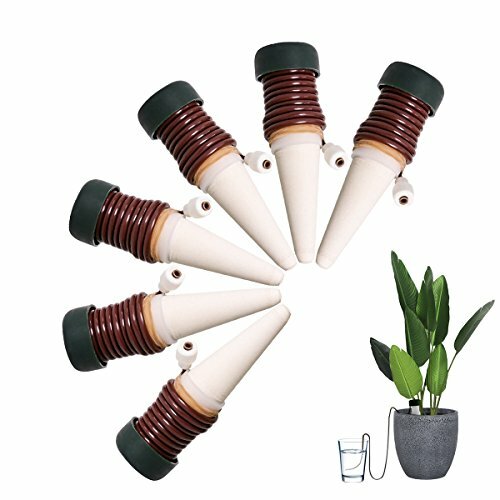 【✿Widely Use ✿】according to different plant needs, can be adjusted by the height of the water bottle.✿Suitable for most plants,Ideal for houseplants，potted plants, patio plants, hanging baskets and outdoor gardens. 【✿Note✿】: The watering stakes are suitable for watering any indoor plant; Please keep the sink and flower pot at the same level; And the sink is at higher level, which will accelerate the process of drip irrigation. ✿On average, a Fangie stake with a 1L bottle will last 5-7 days, several cones may be necessary for larger plants to meet higher water needs;Suggest to test on your plant 1-2 weeks before vacation. If you have any questions about this product by Fangie, contact us by completing and submitting the form below. If you are looking for a specif part number, please include it with your message.